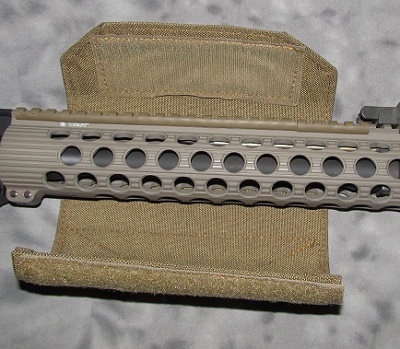 There are a lot of free float rail system options available for AR15 rifles now. In the past few years manufacturers started producing lightweight options without as much rail on them. Most users don’t mount much more than a sling, bipod, and/or light, and 28″-48″ of rail really isn’t needed for mounting those accessories, while the rest gets covered in plastic rail covers. There’s also the totally slick aluminum free float tubes favored by competition shooters and hunters that have also been available for some time. While both systems save weight and reduce cost to the consumer, they have a limitation; they both get a lot hotter than a quad rail system with plastic rail covers. I began using the Troy TRX extreme free float tube last year and within a few months I had found that that handguard was uncomfortable to hold after 2-3 30 round magazines fired quickly. I have nothing against Troy I like the design over all and several other brands I have tried exhibit the same symptoms of rapidly getting hot. It would also get too hot to hold comfortably from merely being in the trunk of my car in the summer (inside of vehicle is easily 160+ degrees in Phoenix). I had seen another competition shooter that had added a nylon sleeve to his fore end to solve the heat issue; so I asked Coyote Tactical to make some for me. The fore end wraps worked as expected and reduce heat transfer to the shooters hands, both from gun fire and environmental conditions. It is a simple cost effective solution that improves the functionality of a rifle equipped with an aluminum free float tube. I have one of these coming to me thanks to your recommendation. I had the same heat issues just from the rifle being out in the West Texas sun. I think this should be a nice lightweight solution. I reached out to Coyote and they said they’d sold the rights to the wrap to you. How can I order one? I’ve got a hot tube…. Uhm what? There’s no patent on these things. Patents and rights are two different things. Order them online here now.